Malaclemys terrapin, also known as the diamondback terrapin because of the diamond shaped scutes on its shell is a medium sized turtle. There are 7 subspecies of Malaclemys terrapin. Their appearance is highly variable. The color of their shell varies from black to yellow with a bold or fine concentric pattern. The skin is dark gray to bone white with a fine to bold pattern of stripes or dots. Females are larger and have a bigger, broader head compared to males. Male diamondbacks have a longer and thicker tail and their cloaca is further removed from the base of their tail. 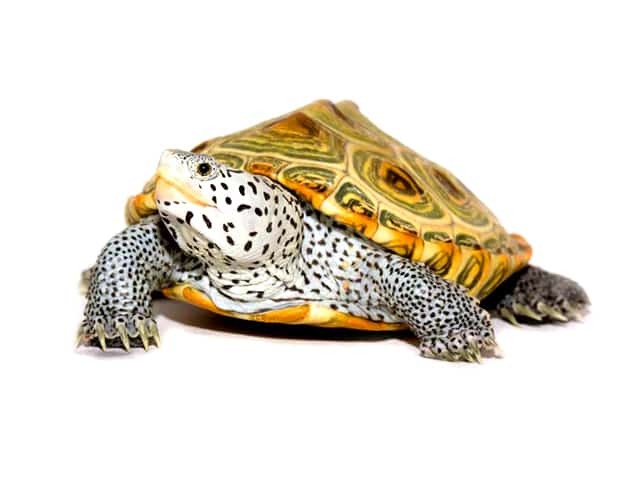 Diamondback terrapin requires plenty of swimming space. A tank of at least 1.2 x 0.5 x 0.5 meters (4 x 1.6 x 1.6 feet) is sufficient for 1 or 2 animals. Both male and female diamondbacks can be kept in a group, as long as ample space is provided. When keeping a group of both sexes, make sure the females outnumber the males 3 to 1 to prevent the females from getting constantly harassed by the males. To give them enough exercise keep the water depth about 1,5x the length of the shell. A big piece of driftwood is also appreciated by the animals. Diamondbacks like to take a nap beneath it or hang on to it to relax near the water surface. As a bottom substrate sand is preferable. Diamondbacks like to dig in the sand and it helps break down their feces into smaller pieces that can be sucked in the filter. Big pieces crushed coral to chew on are also appreciated. The basking area for diamondback terrapin has to be completely dry and spacious so the animals can become completely dry. Above this area a basking spot has to be present so the animals can raise their body temperature. Directly beneath this spot the temperature needs to reach at least 35 °C (95 °F). A water temperature of 22-25 °C (72-77 °F) is sufficient. Also provide a source of UVB (and UVA) light so the animals can produce vitamin D. This enables them to absorb calcium from their food. For filtration a big filter, biological filter or pond filter is suitable. Use one with a capacity of at least 1,5x the volume of the tank. (2 or 3x is better). The recommended pH level of the water is 7-8. Malaclemys terrapin are carnivores.It is prudent to mimic their natural diet as much as possible which consists mollusks like snails and mussels, crabs, vis and carrion. Our animals are fed garden snails, several species of fish, squid, mussels, shrimp and pinkies. Because the fish and seafood are frozen before they are fed, our diamondbacks are also fed several kinds of pellets to prevent any vitamin deficiency from developing. Pieces of sepia are always available for the animals to nibble on when they feel the need to ingest extra calcium. Juvenile diamondback turtles are fed the same kinds of food the adult diamondbacks get. In addition to this, they are also fed small prey items like woodlouse, worms and musquito larvea. Because of their messy eating habits and high waste production it is very important to use heavy filtration to keep the animals healthy. Besides heavy filtration regular water changes are also recommended to keep nitrates low. Diamondback turtles are extremely sensitive to the water quality. In dirty water, especially fresh water, they are very susceptible to infections of the skin and shell. For optimal health of the shell they need a good quality basking spot and exposure to uva and uvb light.